A little over a week ago our travels took us to Central Saskatchewan. Family of four on WestJet flights to Saskatoon then a two hour drive east. We decided to wing it and stay at a small motel in a small town of about 1,500 people. We barely survived one night at said Inn. You know those motels you see in horror flicks? Well they do exist and this was one of them. We seriously considered staying in the car that night after the hotel owner just walked into the room without knocking, a spider bite, water that smelled like a slough and about 3 hours of choppy sleep. We got out early in the morning and decided that the rest of out stay would be an hour away in Humboldt. That leads us to this review. I'm pretty bad at remembering to take photos of these places so the photos included below are from the hotel website. 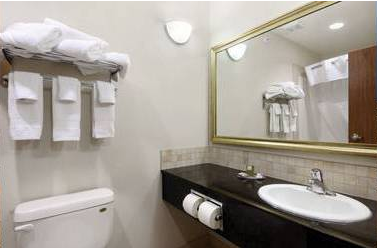 The bathroom had your standard hotel fixtures, nothing fancy at all but appropriate for this type of hotel. 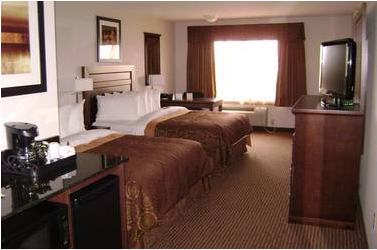 What impressed us the most was how clean the room and the hotel was. Despite being 5 years old the room looked brand new. The shower and bathroom were spotless. It was like we were the first ones staying in the room. The same goes for the carpets, beds and other room furniture. They didn't show signs of aging. The reason I say this is that our last family trip in April had us in San Diego where we stayed at what used to be our favorite location in that area, the Hyatt Regency Mission Bay and the room there really disappointed us. The furniture, the bathroom, the carpet all showed so much wear and tear it we couldn't believe that we loved that hotel 5 years prior. The Hyatt does trump the Canalta Hotel in terms of the resort amenities however if we were just comparing rooms, I would pick the Canalta Humboldt over the Hyatt Regency Mission Bay any day, doesn't matter how fancy the fixtures are. The Canalta's beds were also very comfy, they offered choices of firm or soft pillows and the room also had a small fridge and microwave. The Continental Breakfast that was included with the stay was more than continental as there were hot options like bacon, eggs, and hashbrowns along with a make your own waffle station. Finally, for the kids enjoyment there is also a pool with waterslide and hot tub. This area like the rest of the hotel was pristine. I don't know, but whoever cleans and maintains this hotel sure does it well! We'll definitely be making this our home base for future stays in Central Saskatchewan! 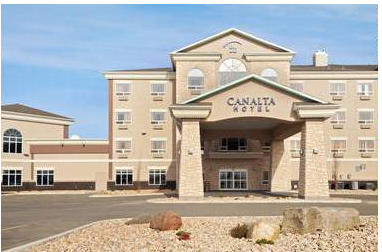 Have you stayed at any of Canalta's locations in Western Canada? What are you impressions of this small Canadian chain? Let us know by commenting below!